This time I've got May Chappell's All Sewn Up Sewing Kit (you'll find it on Instagram as #allsewnupsewingkit). 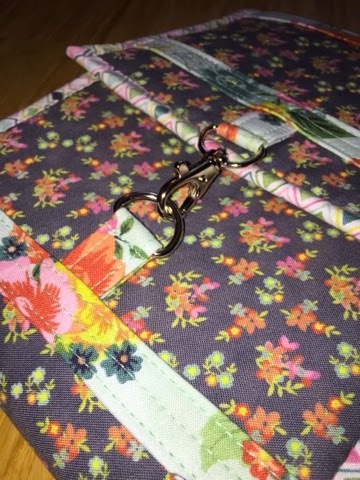 This little cutie finishes at 7" x 9.25", and it's the perfect size to hold a itty bitty rotary mat (this is the one I have in the photo) plus some extra goodies like pins/needles, a small ruler, a pen/marking tool or whatever strikes your fancy. There's even a clear vinyl pocket at the bottom with a zipper closure. I found the most tricky part of the pattern to be selecting fabrics! The largest problem I had was that a very large chunk of my fabric stash is directional. 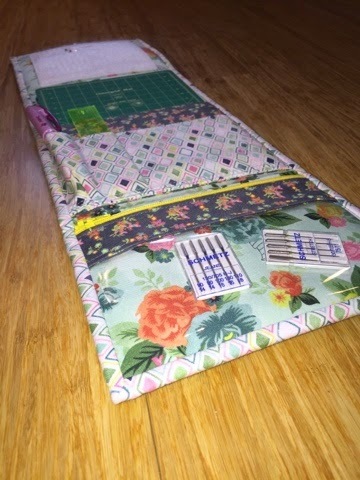 With only 3 fat quarters needed to make the bag, I knew that it would require a less directional print (the bag is longer than the fat quarter, so the pieces are cut with the width of fabric not length). So, I pulled 3 fabrics that I bought on my trip to Texas. 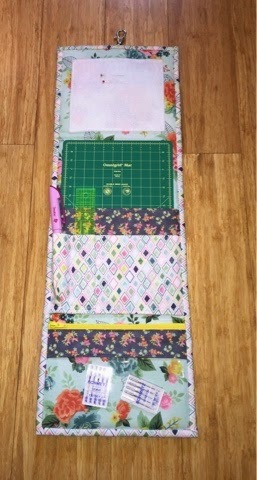 Look at all of the space to store your pins/needles! When I first looked at the supplies list, I was a little surprised to see that it called for fusible fleece (I used Pellon 987F), midweight fusible interfacing (I used Pellon SF101), and my perpetual favorite, By Annie's Soft and Stable, but I absolutely understand now. I know that Lee knows her stuff, so I didn't question it. With a cover that folds over and closes with a swivel hook / d-ring, the bag has the ability to lay flat when open. This gives you easy access to the contents, and when closed, you don't have to worry about things falling out of the larger pockets. The almost 6" x 9" cutting mat nicely fills up the largest pocket, and it gives the bag a little bit more rigidity (I don't think it really needs it because it isn't floppy thanks to the layer of Soft and Stable that is sandwiched inside). I would not be me if I didn't make some modifications to the pattern, but they are very minimal. The first change I made was to use heavyweight vinyl instead of quilter's vinyl. I prefer a little more heft for durability (plus, it's what I had on hand). The second change I made was purely aesthetic - I did 3 rows of stitching on the exterior accent pieces instead of 2 because I liked how it looked. Finally, before I attached the hardware to the bag itself, I ran a line of stitching close to the hardware to keep it from flipping around. That's it for changes. See? Pretty minimal! I believe this pattern is a pretty quick to sew up. I actually made the bag over 2 days instead of the 1 day I had planned. This was not due to any problem with the pattern, I blame Benedict Cumberbatch (aka I watched The Imitation Game with my husband). I cut all of the pieces and fused the required interfacing on day 1, and I did all of the sewing and hand binding (yes, it is hand bound) on the 2nd day. I was done by mid-afternoon with the whole thing, so I think it can be done in a day. If you're prone to distraction, I would say it would be easily completed in a weekend. As a special treat to those of you that read my blog, I'm going to do a giveaway this time. Lee Monroe, the creative mastermind of May Chappell, has graciously offered to provide a free copy of the pattern to the winner. Thanks, Lee!!!! Even if you don't win the giveaway, the pattern is available to purchase through maychappell.com (which is what I did). So, here's how this is going to work... leave a comment below (I'd love to know what fabric you would use for the All Sewn Up Sewing Kit but that isn't necessary. It's just to satisfy my own curiosity). I will leave the comments open for one week. They will close on Friday, May 1 at Noon PDT (see what I did there? The MAY Chappell pattern will be given away on MAY 1st). Yes, I'm terribly clever like that sometimes! 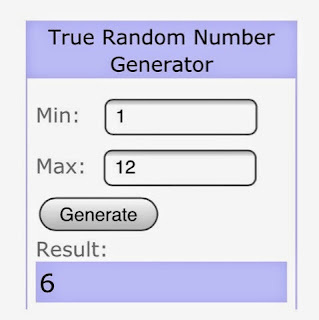 After it closes, I will use a nifty random number generator to select the winning number (based on the order the comments were posted). The pattern will come directly from Lee, so I will provide her with the email address of the winner. Don't forget to check back next Friday to see if you have won, and huge thanks again to Lee for providing a copy of the pattern to the winner! Good luck! random.org picked comment 6, so Carla is the winner! Congrats to Carla, and thank you to everybody that participated. I will pass along the information to Lee so she can make sure you get your pattern. This is awesome Leslie! I would make mine out of Tula Pink, of course! Can't ever have enough Tula Pink fabric. Thanks for the chance to win. I would have to embroider something, but Alison Glass fabric would be great. Your work is awesome as always! Great job! Fun pattern too. I think I would use a mix of Anna Maria Horner prints. Fun project! Tough call on what fabric I would use - maybe a fun skull print! I would use some kind of fruit and vegetable print or owl fabric. Congrats, Carla! You're the winner! 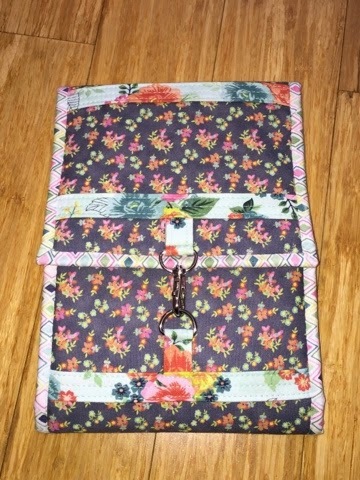 Such a lovely bag!! I would use some Alison Glass sunprints...probably...until I saw other fabric ;) lovely post Leslie!! Wi think I may have to make this sooner rather than later!! I have some Carolyn Friedlander fabrics calling my name! Thanks for the review Leslie!! I would probably use Essex Linen and do an AG Gemology Paper block, so it would match my road trip case! Hi! Love this bag! I would use sewing themed fabric that matches the chair at my sewing machine!! Coordinating my sewing room, or at least trying to! !